At Express Furniture, we understand that every home and its owner is unique. The needs and aspirations of each customer are different, which is why we provide beds in various sizes from single (3'), three quarter (4'), double (4'6"), king size (5') to super king size (6'). 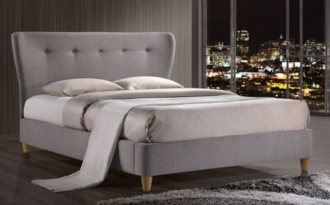 We stock numerous designs from the traditional brass bedstead to the luxurious divan bed, as well as offering the contemporary chrome and metal bedframes. Our robust, wooden bedframes come in a variety of timbers such as ash, oak, walnut and pine. Our Sleep Centre is home to many types of beds made from materials such as brass, chrome, nickel, and black or white enamel, just to name just a few. No bed is complete without a comfy mattress! 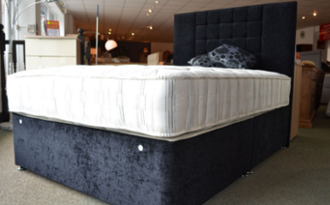 Express Furniture have everything you need from the classic tie sprung and luxurious pocket sprung mattress, to the NASA-designed technology of memory foam, which will leave you feeling as if you are floating in space. Why not check out our new range of ECO divan beds and mattresses? 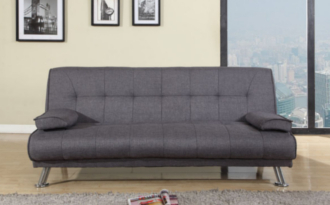 We have guest beds, leather beds, ottoman storage beds, bunk beds, sofa beds, day beds... In fact, we stock more beds than we have names for! 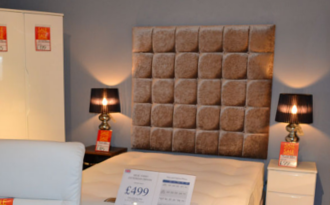 Oh, did we mention headboards? Don't get us started on headboards!